The Vodafone Cloud Services Marketplace (VCSM) creates a “transaction invoice” at the beginning of each month for all licences on your account. Every time you make a change to your licence estate during the month, it creates an additional “transaction invoice” record, too. At the beginning of every month, Vodafone will send you a single-line bill for all your VCSM transactions for the previous calendar month. In this example, the bill sent in early December to the customer “Martin Corporate” will be £258.70. This is the total value of the six “transaction invoices” on VCSM for November. Simply choose any of the transaction invoices from the list to see the details of that invoice and what product or service it refers to. The status of each of these transaction invoices in the Marketplace is always set to “paid”. This is because details of the transaction invoices aren’t sent directly to you. 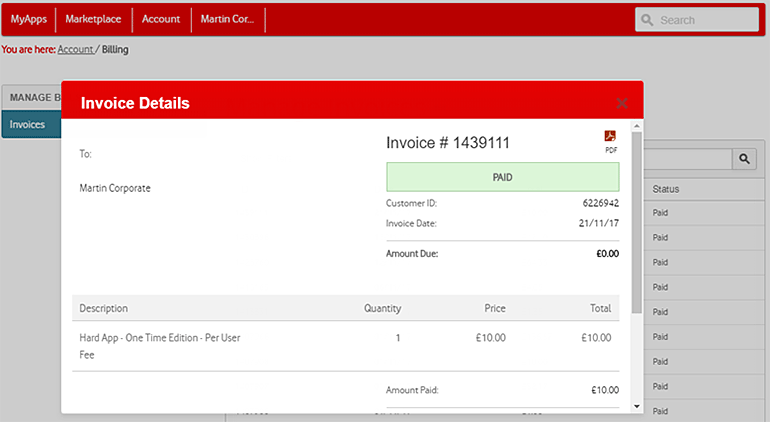 VCSM sends the invoice to your Vodafone account, and our billing system then generates your bill. Transaction invoices remain visible to your Company Administrator and you Billing Administrator within the Marketplace indefinitely, so you’ll always be able to refer back to any invoice should you need to.